The Stage Manager’s office is different than our other puzzle room experiences. 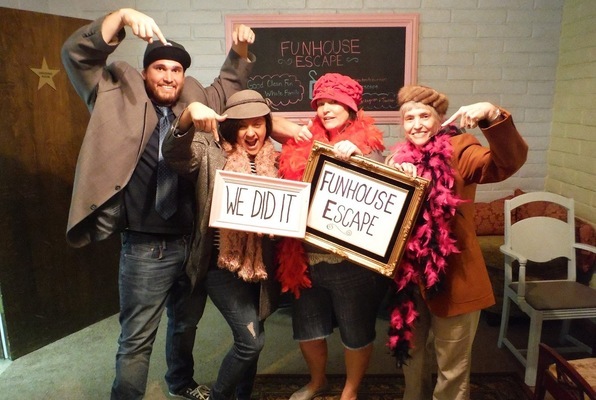 In this unique escape room, instead of completing a challenge with time left on the clock, this experience has you trying to solve as many puzzles as possible within a 60 minute period. There are over 20 stand alone puzzles to choose from, all with different point values and degrees of difficulty. Your goal is to acquire as many points as possible to break the record. Reviews of escape game "The Stage Manager’s Office"
Just did this tonight. I didn't really know what we were doing before we got there but it was the most fun i have had in a while. The owners were so great! You can tell he is passionate about what he does. Their facility was very clean. DO NOT let the initial impression of the entrance fool you. This place was the boom as my wife always says. They were very well organized and well put together. Really got our brains working. I cant wait to go again. The drive was so so worth every mile! This only lets me do 5 stars or i would do more. Its so great to see a person who really enjoys what he does.